Today was the kickoff of the UC Berkeley Open Innovation Speaker Series, including an updated version of the O/U/CI overview talk I gave in Göttingen in May. (More later). However, before I spoke, the students (mostly M.S. students from engineering) got a 15 minute introduction to open innovation from the founder/oracle/sage of open innovation himself, Hank Chesbrough. I don’t have the slides in front of me, but let me share the big picture for anyone who has to teach this to a class. Open innovation is the use of purposive inflows and outflows of knowledge to accelerate internal innovation, and expand the markets for external use of innovation, respectively. Noting the linkage of open innovation back to practice, he said "This is a way of thinking that emerged from observing what companies do in their practices." The idea of spillovers predates open innovation, but in the past it was an afterthought, ignored or neglected — treated as an unintended byproduct. "In the world of open innovation, we argue that you can harness these flows and you can begin to direct the: you can direct them to you, and you can direct your flows to (specific) others outside." There are two main modes of open innovation: the inside out and the outside in. which looks a lot like Chesbrough’s open innovation funnel (Figure 1.3 of the 2006 book). Still, the Xerox strategy was more worried about false positives than false negatives. He noted that at one point, the aggregate market cap of 10 Xerox PARC spinouts (including 3Com, Adobe, Documentum) was more than twice that of Xerox. Is this anything new? Aren't companies already doing this? Yes, but there is a difference of degree today and integration of the various alternatives. Why have companies struggled to adoption open innovation? This topic will be covered by many of the speakers this semester, who talk about best practice. What are examples of good open innovation practice today? We have invited some of the most successful practitioners, so you may get a biased sample from our speakers. (Catching up on #OUI2010 blogging after an overload of material from OUI and AOM). At OUI2010 in Boston, I heard the latest update from Peter Meyer in his writing about collaborative innovation by airplane entrepreneurs in the late 1800s and early 1900s, including the Wright Brothers and Octave Chanute. They were hobbyists, enthusiasts, and frenemies, all seeking to seeking to do better than Daedealus and his son Icarus managed to do centuries earlier. Peter’s talk was one of the most interesting sessions at UOI 2008. Now he tells me he’s trying to flesh out the data, to show the knowledge flows and get it under review at a journal. A version of the paper was presented at Columbia earlier this year. Thinking about Meyer's research project prompted a thought experiment. Would the first manned flight have happened sooner? Would the technology have been more mature? Would it have diffused more rapidly? Would it have been state funded? How would that have changed the incentives? Would it have eliminated redundant investment? Would this have eliminated experimentation in different approaches to propulsion and wing design, the sort of variation-selection-retention that Utterback and Nelson-Winter write about during the pre-paradigmatic period of a new technological paradigm? And finally, would the Wright Brothers have invented matrix management or Tang®? Maybe this isn’t fair: by 1901, a privately-funded solution was right around the corner, so throwing money at the problem probably wouldn’t have sped things up. A better time to fund the project would have been 1880 or 1890. But like all whimsical exercises, there is a serious point here: some inventions have such a pent-up demand and interest that it’s not a question of if it will be invented, but who or when. The automobile, telephone, radio, washing machine and personal computer are all devices that were going to be invented sooner or later — it was a question of who and when, not if. There is no market failure here, no underinvestment, no delayed innovation. Boatloads of capital are needed for risky infrastructure — telegraph lines, railroads, highways — and perhaps for products for which there is no commercial market (three man capsules for lunar orbit). But at least during an era where tinkerers can invent something on their own — or get capital to do so — we don’t have evidence that government intervention will make things better. Given some of the strategic procurement errors made by military bureaucracies before and after WW I, it’s quite easy to imagine how government funding (and control) would make things worse. Christopher Freeman won international recognition for his innovative work on the social and economic context of science and technology. In 1966 he accepted an invitation from Professor Asa Briggs, then Vice-Chancellor of the University of Sussex, to be the founding director of the Science Policy Research Unit (SPRU) at that university. Under Freeman’s leadership SPRU became one of the foremost groups in the world undertaking studies of how societies can maximise the benefits from science and technology while minimising their harmful effects. From the outset Freeman recognised the importance of building interdisciplinary research teams to undertake this work and always tried to employ both physical and social scientists to study particular issues. He was committed to studying science and technology policy in a global context, encompassing both industrialised and developing countries. During his tenure as director of SPRU, 1966-80, he considerably expanded the scope of SPRU’s research and introduced masters’ and doctoral programmes in science and technology policy and in technology and innovation management. After standing down as director, he continued to contribute to SPRU’s research and teaching activities, and in 2001 the University of Sussex named a building after him (the “Freeman Centre”). This now acts as an international focus for the activities he started so modestly in 1966. Freeman was a quiet, effective, inspirational leader, commanding loyalty from his colleagues and the support of many funding agencies. He took a great interest in the research of postgraduate students. Indeed there can be few science and technology policy groups in the world which have not benefited in some way from his inspiration as a mentor, lecturer and teacher. This new journal will deal both with the problems of research and development policy in industry and with the research policy aspects of governmental science policy. Increasing social concern with the short and long-term consequences of scientific research and technical innovation has led to a growing need to relate the private decisions of the individual researcher, laboratory or firm to a wider social context in which the full social costs and benefits of an innovation may find expression. This embraces both R & D project and programme evaluation and decision-making in industry, as well as in government and universities. The social cost/benefit evaluation of research and innovation is one of the most complex problems confronting policy-makers, and several of the papers in this first issue deal with this problem, which will continue to be one of th.e main themes of the Journal. In government research policy, perhaps the key question is how to determine priorities. A paper by one of the Editors in this first issue is intended to initiate critical debate on this fundamental question. The experiences of innovating organisations in attempting, planning and implementing various innovations, whether complex or simple, are relatively little known or studied. The literature which deals with these questions and other problems of research and development policy is relatively unstructured and scattered in the journals of many different disciplines. RESEARCH POLICY will attempt to provide a focus for this literature and the policy debate it evokes. The journal will publish papers relating to industrial R & D, particularly case-studies of innovations and analysis of R & D policy in firms. It is hoped that these will be contributed both by active participants in industrial R & D and its management, and academic observers of the process. One such paper is included in this first issue and we shall feature these studies regularly. Concerning government policy for research, the journal is intending to include papers both by those involved in “science policy” decisions of various kinds, and by independent analysts and critics. The journal will concentrate on European problems including international European R & D experience. It will deal with methods of choice evaluation and programming as well as the measurement of public preferences and the formal theory of decision-making. The issues confronting policy-makers, whether in government, industry or universities, involve questions of value as well as questions of fact and theory. Critical debate and clash of opinion on policy is both inevitable and desirable, and the Journal will provide a forum for such debate. However, in order that this may be fruitful, such controversy must be well-informed and based on understanding of the circumstances, needs and interests of the participants. For this reason the Editors are glad to publish the note by Professor Casimir on “Industry and Universities” and welcome further papers and comments on the respective role of industry, government and universities in research and innovation. Christopher Freeman died this morning, August 16, according to an email I received as a Research Policy reviewer. In a brief note, let me try to capture the debt that we all owe him. Freeman was the founder and first director of SPRU, which was the central incubator of European innovation researchers from its founding into the mid-90s. For example, Giovanni Dosi got his PhD from the SPRU group in 1983 with the dissertation that became Technical Change and Industrial Transformation. If that is not enough, Freeman is the author of three editions of the definitive book on industrial R&D: The Economics of Industrial Innovation. As I’ve worked on my OUCI papers, I’ve turned back to it several times to understand what we know about internal corporate R&D that is sometimes overlooked by OI/UI/CI researchers. I visited SPRU once but never had to chance to meet Freeman, either there or at a conference. Still, several generations of innovation scholars will be indebted to him for his key role in creating our field. May he rest in peace. At our #AOM2010 PDW in Montréal, Herr Doktor Frank Piller gave a talk on a case he researched of Webasto. The talk was both exciting and depressing — and novel and familiar — simultaneously. The company makes certain optional equipment for major car manufacturers, like sunroofs for Mercedes. Compared to auto suppliers, it has a relatively high R&D intensity: 7.5-9%. I’m guessing that’s because a lot of its stuff has to be exciting or people won’t buy it. He told a great story of how the company brought in the lead user method and was admired around Germany, winning awards for its innovative approach to innovation. It made money selling open training to other companies. It even got hired by its automaker customers to tell them what their customers wanted. And then in November 2008, the internal champion was fired and all the OI/UI activities were stopped (A quick Google search finds his name, which Frank didn’t mention). The board and/or management didn’t understand the value of the idea generation and either saw it as a distraction or used the recession as an excuse to get rid of someone who was getting more attention than they were. Frank tells the story better than I, so I’ll defer to his slide deck for the details of the rise and fall of Webasto’s experiment in openness. Let me instead try some free association: this to me is completely reminiscent of all the other innovative processes for producing innovation. As a doctoral student during the 1990s (then in marketing), I hung with the PDMA/JPIM crowd because they were the most innovation-oriented of the marketing academics. I did a self-study on voice of the customer, cross-functional teams, lightweight and heavyweight project managers, and all these other good ideas for improving new product development. After a long time, if there are demonstrable results — or it gets institutionalized into organizational routines — the champion has protégés and assistants who can carry on if he/she disappears. But during its adolescence — or if a new regime wants to come in and sweep out the old — the innovation is only as permanent as the person pushing it. So from a broader perspective, the innovation theories are new but the process by which organizations adopt them remains the same. This seems like a good side bet for a doctoral dissertation: study open innovation practice within multiple firms, but write another paper about how it gets adopted in these firms (or non-adopted or unadopted). This is the ideal dissertation strategy: diversified theoretical perspective from a single data collection exercise. In previous posts, I’ve asked whether crowdsourcing is a theory, including most recently a posting from last week’s OUI2010. The consensus at Monday’s panel — or at least from those listening to the presentation — seems to be that crowdsourcing is an umbrella term that subsumes a range of phenomena, which can be studied using multiple theoretical perspectives. Researchers are already well along in trying to disentangle important differences within that umbrella. Since I’m an OI (or O/U/CI) researcher rather than someone who studies crowdsourcing, let me focus on three aha! moments. Marketplaces for work: Small human intelligence tasks: Amazon Mechnical Turk. I might quibble since not all “open source” fits the open content/peer production paradigm — just as not all open source is open innovation — nor is “open source” exactly the same as Wikipedia or other “open content” processes. I suspect the bullet point was not meant to imply this, only that the peer production open source communities fit into a group of similar phenomenon with Wikipedia (which at the 5,000' level is certainly true). The second point, made by Karim Lakhani, is that firms typically run crowdsourcing in one of two modes. The first mode is a competition, often winner-take-all, with all the dynamics of winners, losers, incentives, etc. (Anyone on the UI/OI circuit in the past 3 years has heard Karim give a TopCoder talk, and now at least one of these papers is forthcoming.) In this case, you want to smoke out the best idea from a large population, without demotivating participants through long odds of success. However, the open source and other collaborative modes are fundamentally different, because individuals build upon each other, and rather than accessing the “best” knowledge of the crowd, firms are using the collective (and cumulative) knowledge of the crowd. (In the past I’ve asked if crowdsourcing is open innovation or user innovation — in this case it looks a lot like cumulative innovation). These are clearly not disjoint, since the latest crowdsourcing fad is allowing competition between ad hoc (or pre-formed) teams. Still, Karim’s right that the dynamics of the two are fundamentally different and should not be conflated. This increased conceptual clarity shows that academic research on crowdsourcing is maturing much faster than I’d realized. (I mainly follow crowdsourcing for this blog, since my own empirical research tends to be on B2B open or user innovation). Every new phenomenon goes through this process, when academics start trying to make sense of the phenomenon, and eventually are able to abstract universals without getting the facts wrong. This is the process we saw with “Internet,” “e-commerce” and “open source” research being replayed all over again. I was living the first one, tried to ignore the second one, but was in the thick of the third. Today, researchers who ignore the canon of open source research will be suitably chastised (at least at any journal that picks competent reviewers.) Crowdsourcing is a ways from that, but certainly the landscape is changing rapidly and authors need to keep up to date with the latest work. During my discussions at AOM2010, one of the topics that came up is that sometimes the term “open innovation” is conflated with other terms and phenomena. 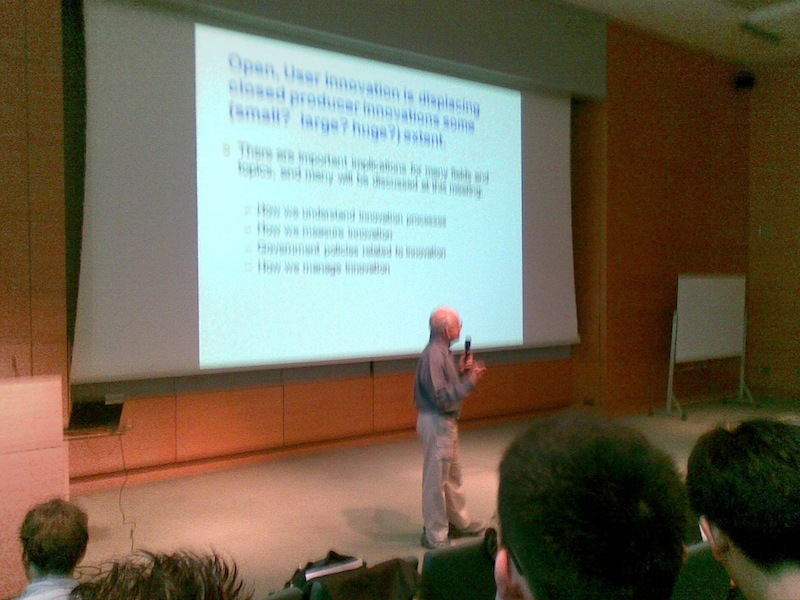 My view: don’t call it “open innovation” unless you mean it in the Chesbrough (2003, 2006) sense. I say this not as a minor functionary of the "open innovation” dogma, but for the same reason I would tell a Ph.D. student to not use “RBV” or “five forces” or ”social capital” for other purposes than as defined in the mainstream literature. It creates confusion, and suggests confusion in your own mind (not a good thing). 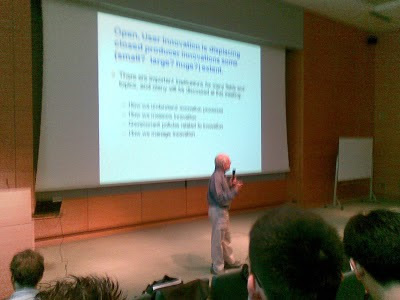 There are other terms available, such as “open and distributed innovation” (as used by von Hippel 2005), collaborative innovation, or other terms that I can’t think of right now after 72 hours of AOM. Similarly, not all “open source” is “open innovation.” In Chapter 5 of the 2006 book, the editor of Section II(Chesbrough himself) pushed Scott Gallagher and I to tease out the overlaps and differences between open source and open innovation. I’m certainly glad we did, as it gave me a conceptual clarity that I’ve used ever since — and perhaps with this blog I can inform those who didn’t wade through 300+ pages of academic prose. The key discussion is on pp. 99-102, and is not in other versions of the paper (because the change came at Henry’s request). Figure 5.1 summarizes the main point: there is open source that is not open innovation and open innovation that is not open source. The latter is trivial, because things like Windows and other licensed proprietary software are examples of external innovations licensed by PC makers that they don’t develop themselves. Conversely, the folks at the Free Software Foundation or Project GNU are not interested in making money for companies, which is the whole point of Chesbrough’s book, paradigm and body of research. There are many examples of non-commercial OSS (or FOSS or FLOSS if you must), just as there are other forms of non-commercial online communities that don’t fit the open innovation model. So “open source” as a construct is not identical to “open innovation”, “online communities,” “open content,” or for that matter “free software.” (Some people treat “free software” as a proper subset of “open source” and some don’t, but no one treats them as synonymous.) The better researchers are using their terms more precisely, so that the research findings of multiple authors can be contrasted and integrated without creating needless confusion. West, Joel and Scott Gallagher (2006) “Patterns of Open Innovation in Open Source Software,” in Henry Chesbrough, Wim Vanhaverbeke, and Joel West, eds., Open Innovation: Researching a New Paradigm. Oxford: Oxford University Press, pp. 82-106. #OUI2010 is over, and with it the annual gathering of user innovation, open innovation and a few cumulative innovation scholars. This conference is not run by me, but has village elders like Nik Franke and Christopher Lettl. 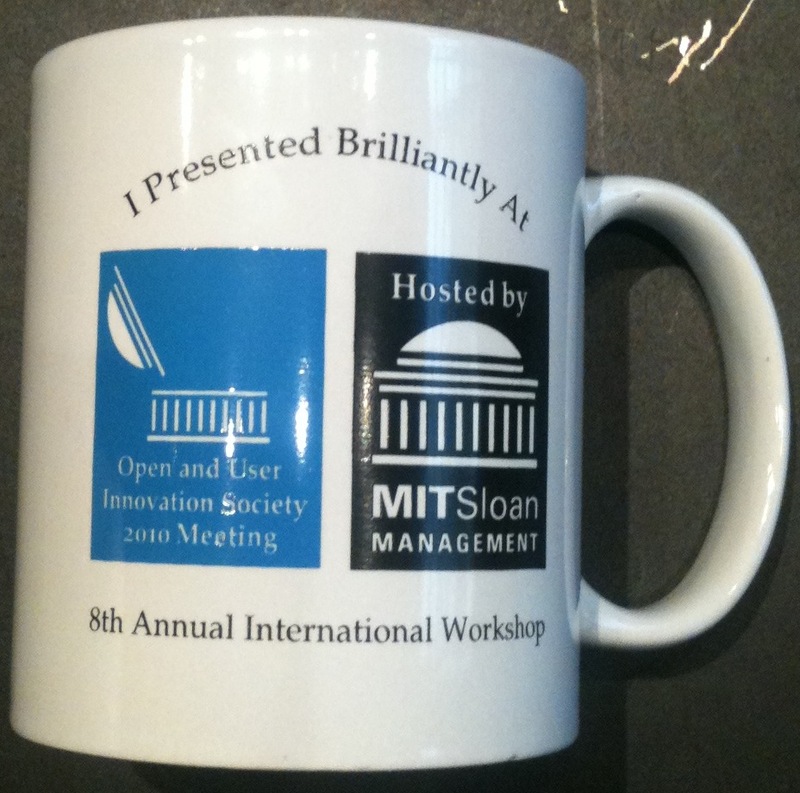 We also ended the conference with a mug that proclaims “I Presented Brilliantly At 8th Annual International Workshop.” The most unusual thing was the reference to the “Open and User Innovation Society,” complete with a logo. On Monday, I asked co-organizer Mako Hill, who didn’t know much and didn’t know that there was never previously a “society”. On Wednesday, I meant to ask Eric or others about this seeming shift, but I didn’t get a chance. This was an unusual conference for me, the first effort that I tried to tweet in realtime. With more than 120 two-minute talks (half of them ads for longer sessions, half the entire talk) it was impossible to post an update for each and every one. Still, I had people joke that “before I could figure out what the talk was about, you were already tweeting it.” (Maha Shaikh of LSE lagged on Monday, but on Tuesday and Wednesday nearly matched me tweet for tweet). There were 8 papers in the “open innovation” sessions and another 5 that mention “open innovation” in their title, a total of about 10%. Only 2 papers about cumulative innovation — one explicitly (Peter Meyer’s latest paper on early airplanes) and one implicitly about cumulative innovation and user entrepreneurship (Yu Xin on mountain bikes). Not enough on user entrepreneurship, with only 4 official papers. In addition, Emmanuelle Fauchart and Marc Gruber identified user entrepreneurs within all nascent entrepreneurs, although “Schumpeterians” have become “Darwinians” in the latest telling. Lead Users were officially only 5 papers although many of the ideas were present in other papers. Communities remain very important — officially 30 (one-fourth) of the total, although some “firms and users” papers were also related to communities. Open Source also remains important, with 10 papers in the official section and a total of 12 overall. One of those 12 open source presentations was mine — asking how what we know about creating successful (sponsored or autonomous) open source projects could be used to develop a viable open source community for primary and secondary education. I hope to post more later. Overall, at the conference Eric used the conference to continue the mission he started with Democratizing Innovation, to change public policy (as well as public perceptions) to shift power away from producers towards users. Judging from the papers, not everyone shared this goal, which suggests that OUI has become a “big tent” that subsumes a wide range of research on distributed innovation. At this point in my career, I strongly prefer focused workshops and small conferences to the zoos that the general conferences have become. I am grateful for the chance to participate in OUI for the past three years, and to be welcomed by the community as one of their own, despite being more of an OI person than a UI person (particularly on policy issues). Photo by Marcel Bogers, during our post-OUI2010 meeting to work on our O/U/CI papers. Of the four long papers on crowdsourcing presented at the conference, two were about internal crowdsourcing. The most ambitious was a paper by Hind Benbya and Marshall Van Alstyne (presented by the latter) about crowdsourcing can be used to create internal markets for knowledge, rather than the more hierarchical and bureaucratic approaches of more traditional knowledge management. As in external crowdsourcing, they use the two-sided market perspective (which Van Alstyne helped invent) to match buyers and sellers. However, their new wrinkle is to argue that a price system — rather than internal fixed incentives or a rating system — is necessary to stimulate the right quantity and quality of idea generation. They spend a lot time trying to establish an appropriate price with its own currency that can be mapped onto a dollar price, and have a real system up and running that's being used already by a few banks. For external crowdsourcing, Karim Lakhani talked about his research with Kevin Boudreau on using TopCoder to crowdsource a solution for NASA to reduce the weight of medical kits for space shuttle astronauts. The company issued a press release last week about the success of the competition. In other words, crowdsourcing is really about systems and incentives, not any great new theory. The systems are the same sort of IT systems that have been refined over decades for online communities and collaborations. The incentives, as economists like Van Alstyne correctly note, are a matter of setting up efficient markets to self-regulate the supply and demand for ideas that are being sourced — and, as with all markets, the institutions to make the process run with transparency and efficiency. I’m here this morning at the first day of 8th Annual International Open and User Innovation Workshop at MIT at Cambridge, Mass. We will be going until 1pm on Wednesday. After an introduction by Eric von Hippel, we have started the blitz of 2-minute capsule overviews of 25 long papers being presented today. I counted 124 talks: 61 full papers (almost all with the 2 minute tease) and 63 "research updates” which only have the tease. One of the co-organizers, Mako (Benjamin Hill), said that 180+ attendees are registered. Last year in Hamburg there were 31 full papers and 44 “in progress” submissions. As with the 2008 Harvard-MIT conference, the US workshops remain significantly larger than the European ones. With this many papers, it’s going to be like drinking from a firehose, but as in previous years, I’ll try to highlight both trends and interesting snippets.